There are many things I miss about my local coffee shop closing down. One of the main things would definitely be the baked goods. There is nothing like grabbing a cup of coffee with a nice warm scone right out of the oven. So instead of being sad all day I decided I would make my own! The recipe that I used is actually for snickerdoodle scones but I put my own little twist to make them Mocha Scones. Instead of using milk or cream I used the International Delight Mocha iced coffee. And I also only sprinkled the scones with sugar! Other than that I did everything the exact same way. I almost couldn't wait to have one, before I took the pictures, because they smelled like heaven and were perfectly crunchy and gooey! Today I opted for some cold coffee (same thing I used in the recipe... YUM!) but scones go perfectly with just about anything! Happy Treats! Preheat the oven to 400° F. Line a baking sheet with parchment paper or a silicone baking mat. In a large mixing bowl combine the flour, sugar, baking soda, cream of tartar and salt; stir together with a fork. Add the cold butter to the flour mixture and cut the butter into the dry ingredients using a pastry cutter or two knives, until the mixture is crumbly and the largest butter pieces are the size of peas. Combine the milk and vanilla in a measuring cup. Pour the liquid over the dry ingredients and stir together with a fork just until the mixture forms a cohesive dough. If necessary, knead the mixture just a few times by hand to bring the dough together. Transfer the dough to the prepared baking sheet and form a large round disc about 8-9 inches in diameter. In a small bowl, whisk together the sugar and cinnamon for the topping. Sprinkle generously over the top of the dough round (you will not need to use all of the topping.) Bake for about 15-18 minutes, or until a toothpick inserted in the center comes out clean. Allow to cool on the pan, then slice into 6-8 wedges for serving. CONGRATULATIONS!!! 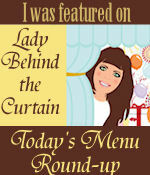 Your recipe is being featured on Today's Menu Round Up! Please go grab a "featured " button. THANK YOU for sharing your recipe with us at Cast Party Wednesday!